One of the reasons that I was excited to move to Virginia, is because of its pivotal role in the history of the United States. In 1607 the London Company established the Colony of Virginia as the first permanent New World English colony. Eight US presidents were born in Virginia and the Virginia General Assembly is the oldest elected government in the Western Hemisphere, dating back to 1619. Winchester itself was a key strategic position for the Confederate Army during the Civil War with many historians claiming that over the course of the war Winchester changed hands as many as 72 times – 13 of those changes happening in one day! I was a history major at university and did a couple of papers focussing specifically on American history. I had a great teacher for both of these papers and as a result really enjoyed delving into America’s rich and colourful past. 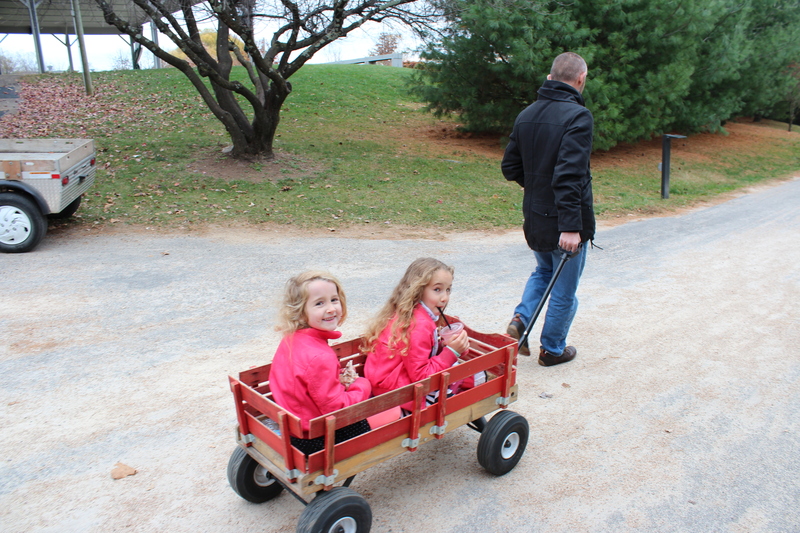 Virginia provides so many opportunities to experience this past and last weekend we took our first steps back in time. About eighty miles south of Winchester you will find the city of Staunton – pronounced here as Stanton. Staunton is number 10 on the Simthsonian’s list of the 20 best small towns in America, is the birthplace of President Woodrow Wilson and is home to the American Shakespeare Centre. 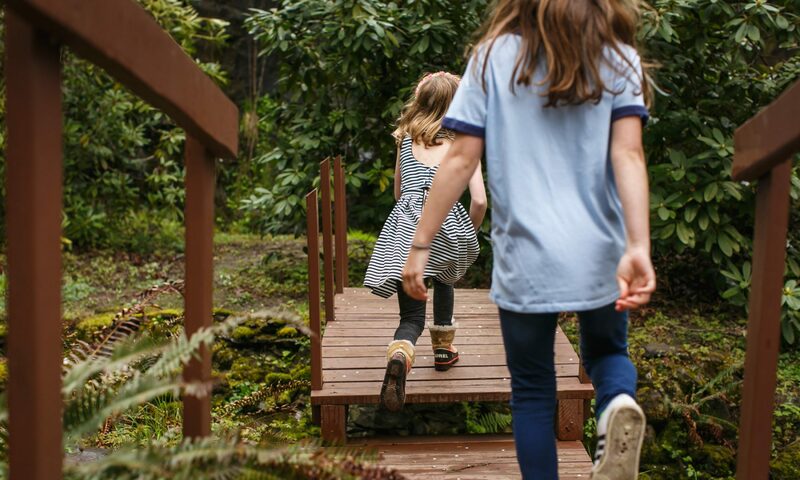 Our destination was the Frontier Culture Museum – an outdoor exhibition that tells the stories of the thousands of people who migrated to colonial America. These pioneers came to Virginia in the 1600’s and 1700’s from communities in England, Ireland, Germany and West Africa. Many of the early settlers were farmers or rural craftsmen who were drawn to the American colonies by opportunities for a better life. Others came against their will – taken as captives to work on farms and plantations. 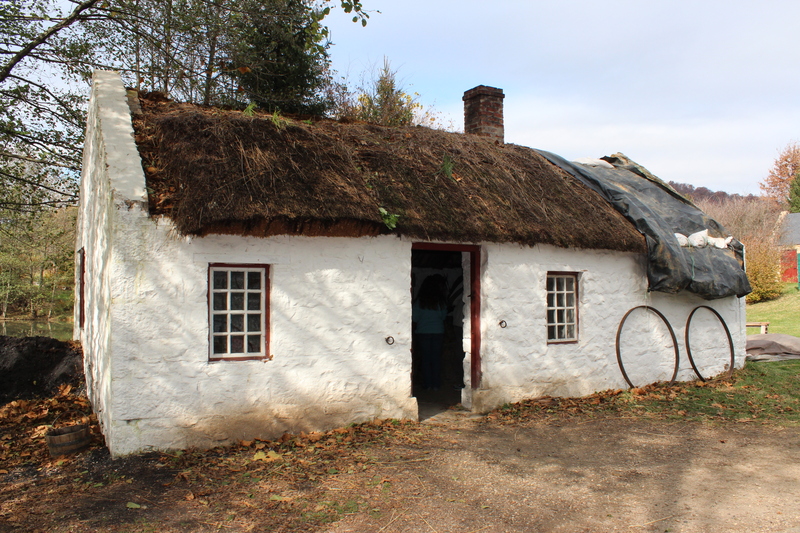 To tell their stories, the museum brought examples of traditional rural buildings from England, Ireland, Germany, West Africa and America and reconstructed them piece by piece on the grounds of the museum. 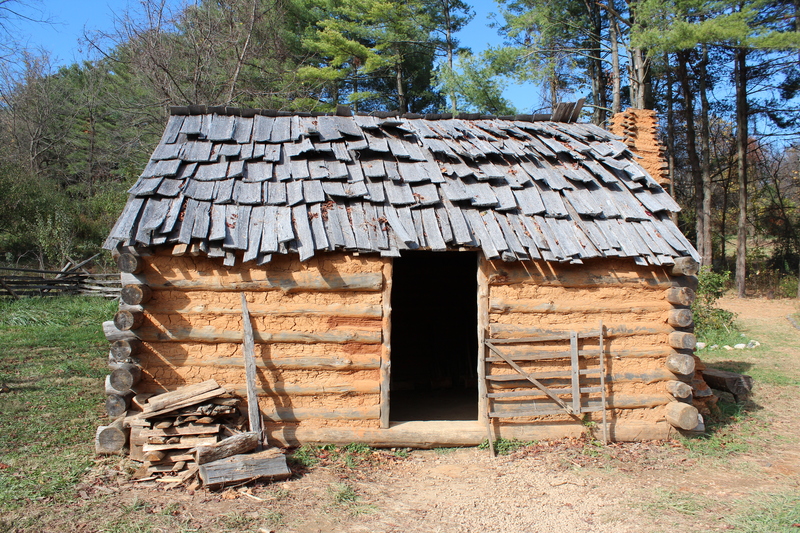 Other buildings were reproduced to accurately depict living conditions at the time. Entrance to the West African Village. 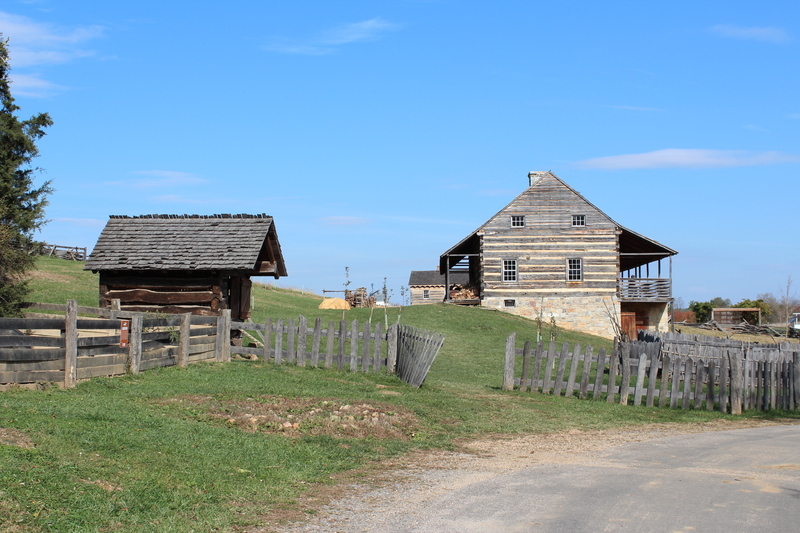 These buildings are reproductions created by the museum. 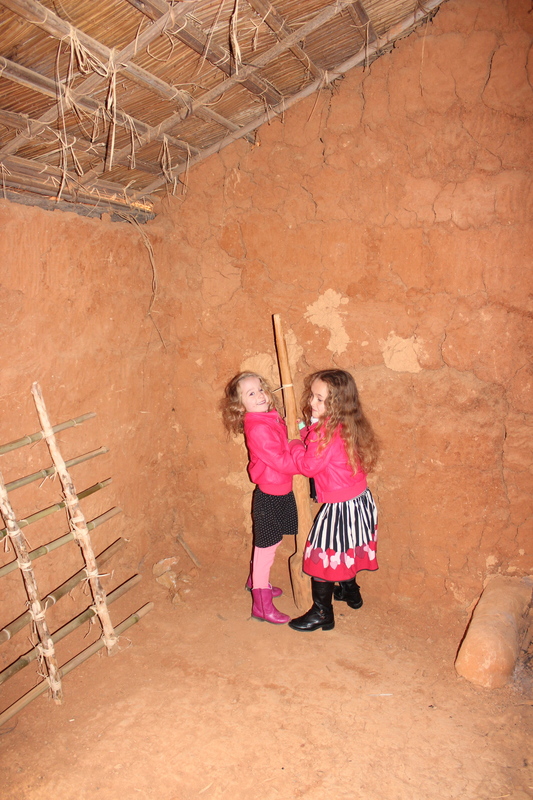 A little bit of housework – West African style. From West Africa we travelled to England in the 1600’s. 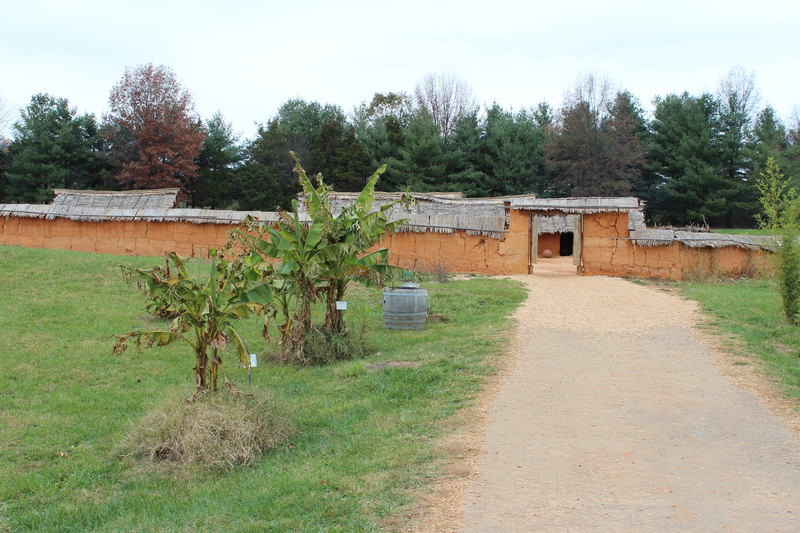 About 120,000 English migrants came to Virginia in the 1600’s. 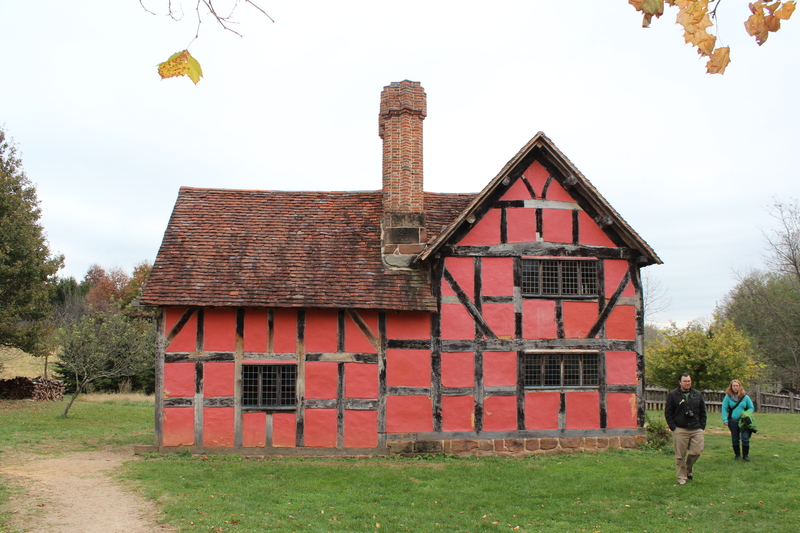 The farmhouse too came all the way from England and was rebuilt in the grounds of the museum. A very colourful little piece of England. One of the great things about this museum were the guides. Inside each of the houses was a member of the museum staff dressed in the clothing appropriate to the house’s country of origin and the era from which it came. 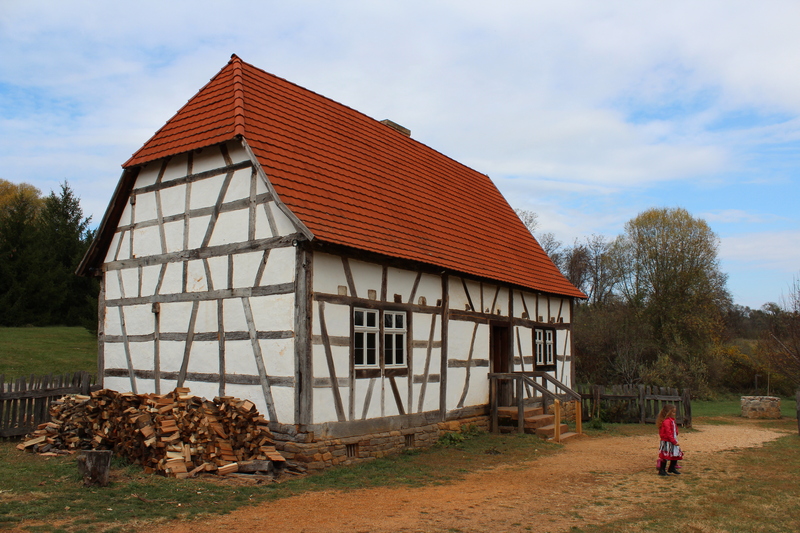 They were happy to talk about the history of the building, its inhabitants and why they chose to leave their country…and answer any questions you might have. I got talking to the guide in the English farmhouse and literally had to be dragged away after about twenty minutes. It was fascinating and because it was a quiet Sunday at the museum, at every building we pretty much had a guide all to ourselves. 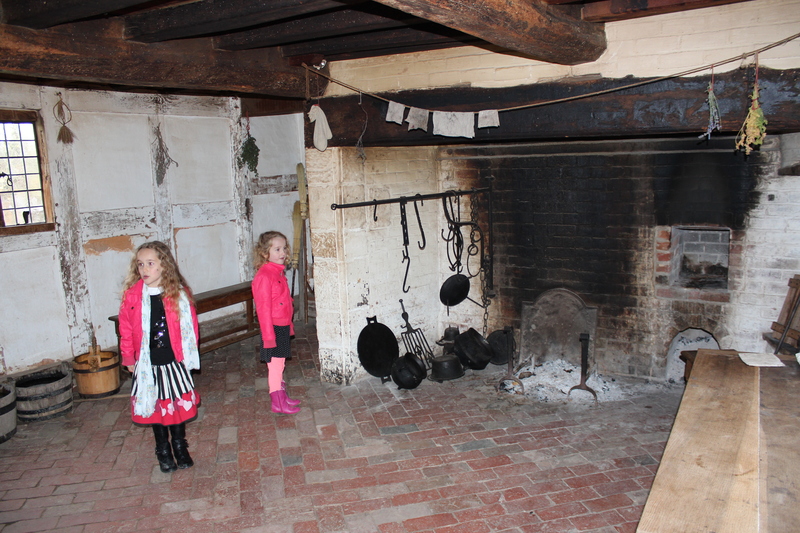 Checking out the English farmhouse kitchen. 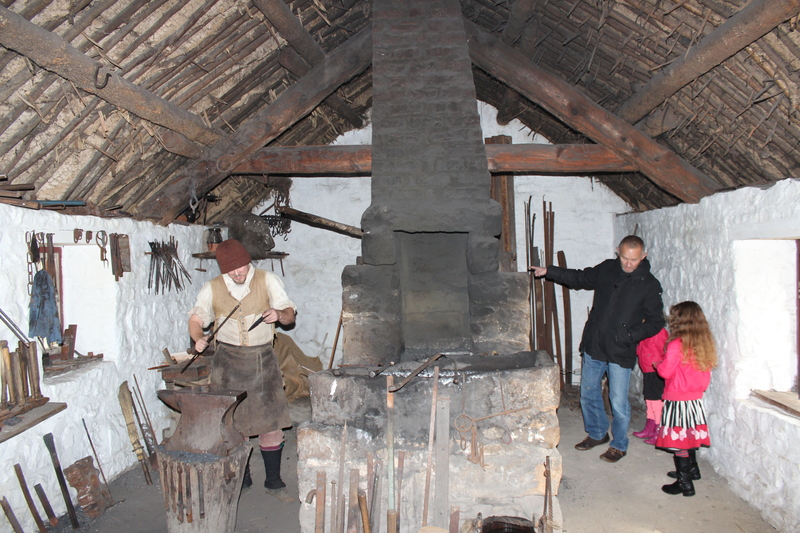 The Irish part of the exhibition consisted of a blacksmith’s forge from the 1700’s which was brought over from Ulster. It had stayed in the same family and continued to operate as a blacksmith’s until the 1960’s. 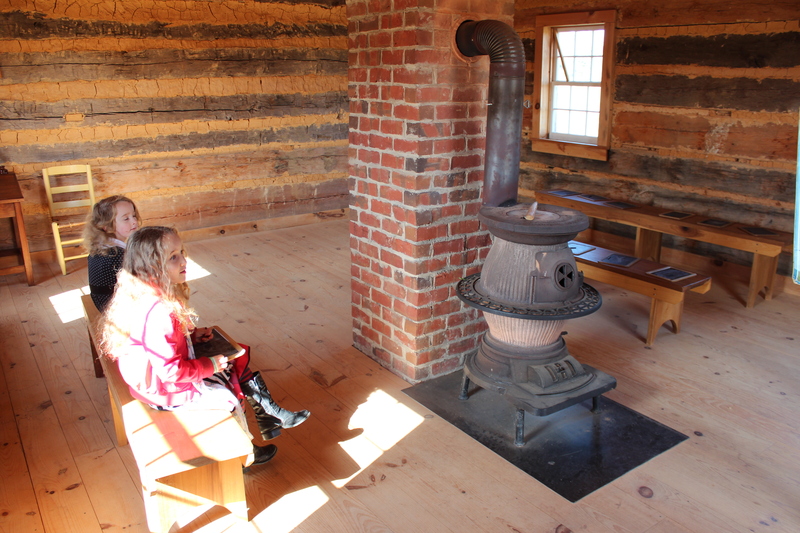 Inside we found a guide working on the hot fireplace, mending implements from other exhibits around the museum. The Irish forge carried all the way from Ulster. Watching the blacksmith at work. Germany was the next stop on our tour. German migrants were the largest group of non-English speaking Europeans to settle in colonial America. 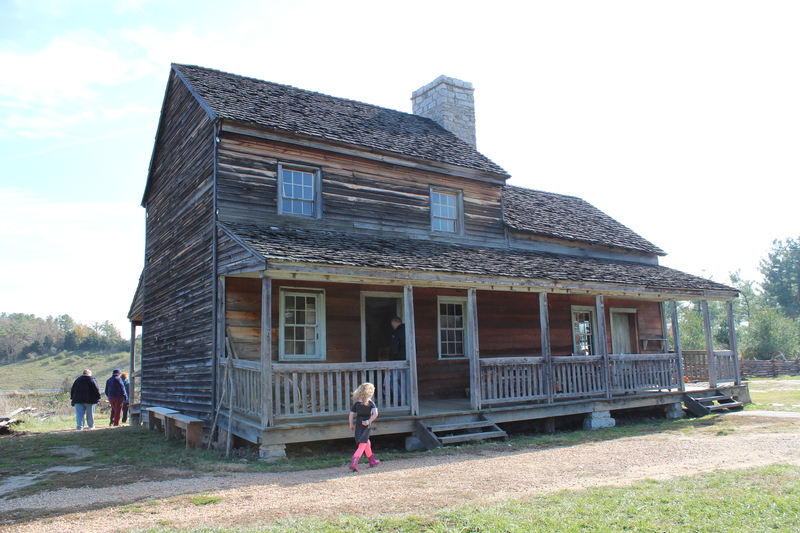 We explored the farmhouse and buildings and listened to the guide explain the origins of the Appalachian dulcimer – a musical instrument that owes its existence to the German scheitholt, a stringed instrument which was played by placing it on a table or one’s thighs and plucking the strings. The guide played for us the Elvis Presley hit “Wooden Heart” which is based on a traditional German folksong. 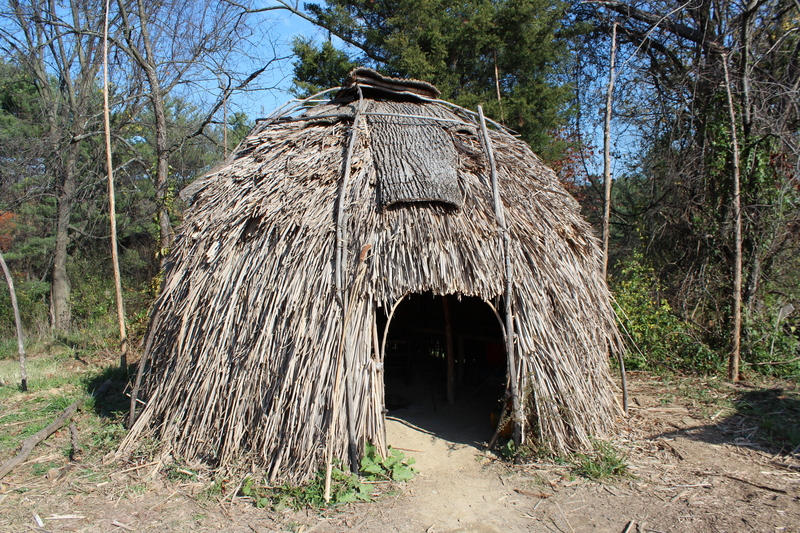 There was also a reproduction of a Native American settlement. The other part of the museum depicted the settlements that grew in colonial America and how, over the years, elements of all the differing cultures that migrated to America were incorporated into America’s own emerging culture. An American farm in the 1740’s. 80 years later, farms in America looked more like this. Hard at work in a school house from the 1850’s. An American farmhouse from the 1850’s. We all came away from the Frontier Culture Museum a little more knowledgable about the history of our new corner of the globe, and with our appetites whetted to find out more. It was a very enjoyable day and if you click on the link to my Flickr photos you can see many more images from our first foray into American history. I’ve also added to Flickr a whole lot of photos that I took in Antwerp before leaving – places and buildings that I really liked. If you’re interested you can find them in the set called Beautiful Antwerp. The very important holiday of Thanksgiving is just around the corner so I will be sure to write and share what we will be getting up to. I must be spending too much money at the supermarket because I have already qualified for two free turkeys! November 11th which is remembrance day in UK – my thoughts took me back to Antwerp and Dad and I’s wonderful and poignant trip to Etaples. Keep up the info, I just love it.